Our Juvenile section of the club is thriving, we field teams for both boys and girls at football, Hurling and Camogie. The juvenile section has a dedicated committee who work tirelessly to ensure we have a thriving section which is fun for all. The club runs Skills and Drills Camps at Easter and in the Summer. We cover all age groups from age 4 upward, embracing both hurling and football for boys and camogie and football for girls. We have developed a structure to ensure that the games and teams are available to enable player’s progress from one age-group to the next. We aim to facilitate player recruitment, retention and development with planned transitions from one team to the next ensuring that the appropriate team management and coaches are in place well in advance of participation in formal competitions. 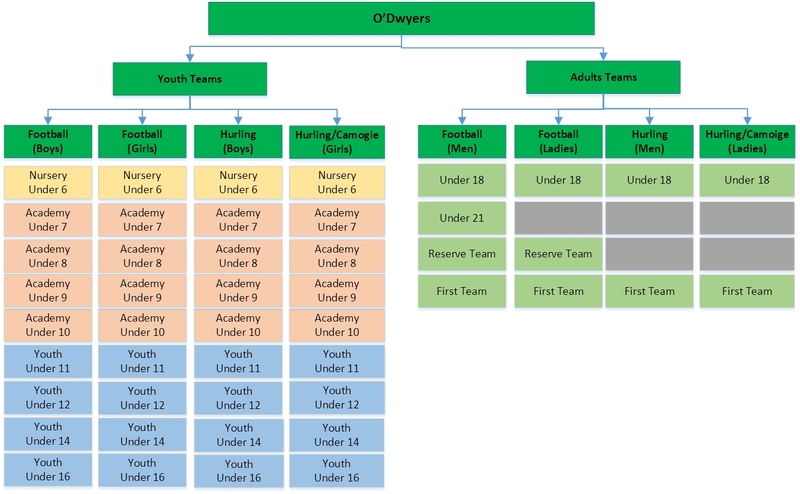 The club operates three programmes to progress players through to minor and adult teams. This programme caters for Under 6s and will be overseen by our Og Dwyers Coordinator, with dedicated mentors and coaches, often with the assistance of senior players. We introduce children to Gaelic games in a relaxed and fun way, with a focus on the ABCs – agility, balance and coordination. Parents are encouraged to help out and take part as much as possible. Newcomers are welcome at any time: parents, simply come along any Saturday morning before 11.00 A.M. – and don’t forget to bring your children! This programme caters for players from Under 7s to Under 10s in both football and Hurling/Camogie and is overseen by a Youth Officer in conjunction with the Head Coaches. We have a programme of games for all players involving Go-Games and Blitzes within the Club and with other Clubs that ensures all players get meaningful activity in an environment that promotes skill development. We also organise internal Mini-Leagues to foster team integration. This programme caters for players from Under 11 to Under 18s and will be overseen by both the Football Development Officer and the Hurling/Camogie Development Officer, in conjunction with the Head Coaches.